Geologists like to look back in time. The SEAmBOTH study area underwent dramatic changes ca. 10 300 years ago, as the Fennoscandian Ice Sheet retreated from the area. The enormous weight of the ice sheet had pushed the Earth´s crust downwards creating a huge depression. The crust still balances itself, in the process called land uplift. Current land uplift rate is 8‒10 mm in coastal area in Bothnian Bay in comparison to 3‒4 mm/year in Helsinki region. Map of the maximum extent of the Veiksel-ice sheet in Northern Europe. Picture: Harri Kutvonen, Geological Survey of Finland, adapted from Lundqvist & Saarnion ja Andersen et al., small changes done by Suvi Saarnio. Northern Bothnian Bay is closer to the former ice sheet center where the ice burden was heavier than in the Helsinki region. Geological formations indicating previous shoreline positions can be found inland some tens to hundred kilometers from the current coast. For example, shoreline deposits that formed some 9500 years ago are currently located 60 km from the current coast, ca. 100 meters above the current sea level. This gives some idea of the land uplift magnitude. Because of this isostatic depression, deglaciated study area was submerged right from the start. First water came from the melting ice sheet, later saline water started to flow into the area. These changes are related to the whole Baltic Sea Basin connections to the ocean and saline inflow patterns via Danish straits. Currently salinity is very low, as large rivers bring lots of fresh water into the northern Bothnian Bay and saline water inflows nowadays rarely reach the northernmost Baltic Sea. As different environments produce different kinds of sediments, this information can be used in reconstructing past/present conditions. In favorable circumstances, a single sediment core may reflect deglaciation time, different stages of the Baltic Sea development and modern sedimentation processes. Geomari is the vessel used by Geological Survey of Finland in the whole Baltic Sea area. Photo by Kotilainen 2013, Geological Survey of Finland. Collecting sonar data while moving in the research area. The data is analyzed more specifically later on. Photo by Kotilainen 2013, Geological Survey of Finland. More often sediment record is not complete. One reason is that in shallow sea areas, storms and currents can very effectively erode, transport and re-deposit sediment. A good example of this from the SEAmBOTH area is a thin layer (1‒10 cm) of redeposited sand covering older deposits in many places. Therefore, the geological interpretation is built from several pieces, as a single source of information usually yields just a part of the story. Sample 1: Shallow surface core (length ca. 45 cm) from the SEAmBOth study area consists mostly of mud. Sediment surface on left. Photo by Geological Survey of Finland. Sample 2: Box-corer sample from sediment surface (length ca. 10 cm) shows a thin erosional sand layer on top, below there is mud and clay. Photo by Geological Survey of Finland. How do you study underwater geology? The answer is in geophysics: different acoustic-seismic devices transmitting sound pulses towards the sea bottom. These pulses behave differently in different types of sediments. Reflected pulses are collected by receivers and processed by a suitable software. End product is detailed information on bathymetry, sea-bottom morphology, sediment type and sediment thickness. Inspecting a sediment sample. This sample is less than one meter long tube sample from the sea bottom. The different layers in it can be dated. Photo by Eräkare 2013, Geological Survey of Finland. To run this kind of geological survey, you need a research vessel with all the necessary equipment (e.g. multibeam, side scan sonar), experienced ship crew and at least relatively good weather. Data interpretation requires geological knowledge and it is not always a straightforward task. Therefore, underwater videos and samples from the sea bottom are extremely useful in validating the results. Bathymetry and seabed substrate information can be further used in geodiversity and habitat models, i.e. models describing geomorphological and soil features and systems that have created these features, and different natural environments for plants and animals. These two underwater kingdoms – geology and biology –function together in many ways. 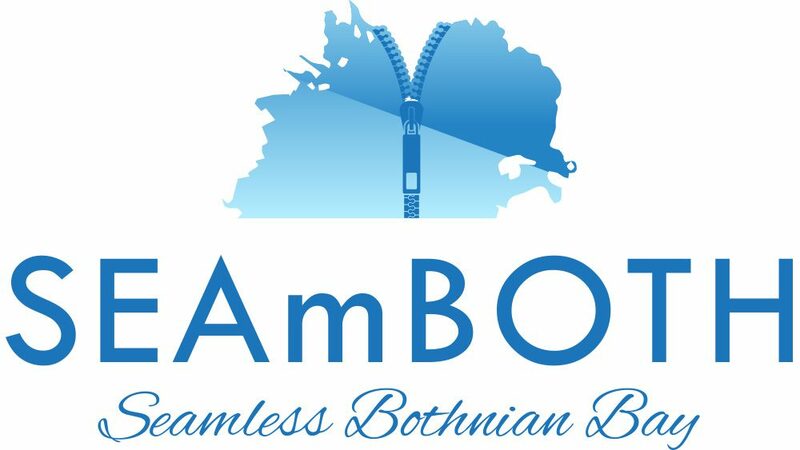 That connection of kingdoms we, Geological Survey of Finland and Geological Survey of Sweden, and the biologists, are looking for in the SEAmBOTH project. An example of acoustic-seismic research setup: Geological survey of Finland´s R/V Geomari. 1: multibeam echo-sounder, 2: sediment (single beam) echosounder, 3: side-scan sonar and 4: seismic reflection device. Illustration by: Harri Kutvonen, Geological Survey of Finland. Written by Outi Hyttinen, Geological Survey of Finland.